Trá an Dóilín, An Cheathrú Rua, Co. na Gaillimhe. 05 May 2008. Michael Guiry. © Michael Guiry (mike.guiry@nuigalway.ie). Published in: Trevisan, V.B.A. (1845). Nomenclator algarum, ou collection des noms imposées aux plantes de la famille des algues. pp. 1-80. Padoue [Padua]: Imprimerie du Seminaire. Type locality: "In Mari Europaeo" (Silva, Basson & Moe 1996: 410). Holotype: OXF, herb. Dillenius undated, unlocalised specimen labelled ‘Confeva marina gelatinosa corallinae instar geniculata, crassior.’ (Maggs & Hommersand 1993: 184). Reported by Athanasiadis (1996) as Griffithsia corallinoides (Linnaeus) Batters (1902: 84). John et al. 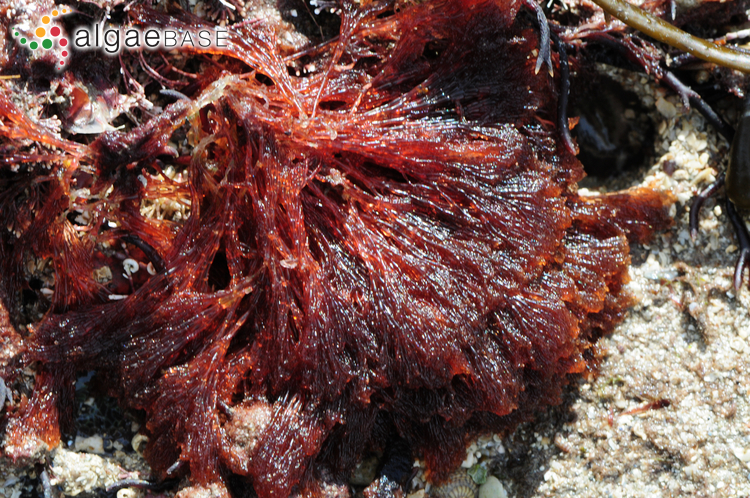 (2004) cite Griffithsia corallina (Lightf.) C. Agardh as a synonym of this species. English: Mrs Griffiths's Coral Weed (Bunker et al. 2010). Gelatinous, tufted, uniseriate, ecorticate, crimson filaments, to 200 mm long, repeatedly dichotomous, axils wide. Articulations club-shaped, 4-5 times as long as broad in lower parts, short and beadlike distally. Said to have a strong smell. On rocks, stones and shells, lower intertidal pools and subtidal, in sheltered waters, occasional to frequent, widely distributed. Most obvious in spring and early summer. Silva, P.C. (1980). 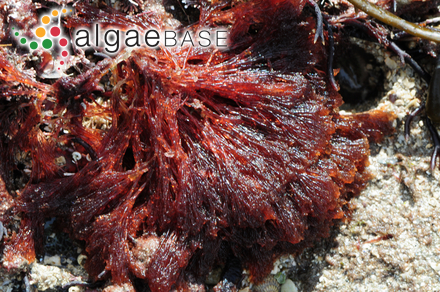 Remarks on algal nomenclature. VI. Taxon 29: 121-145. Accesses: This record has been accessed by users 3534 times since it was created.